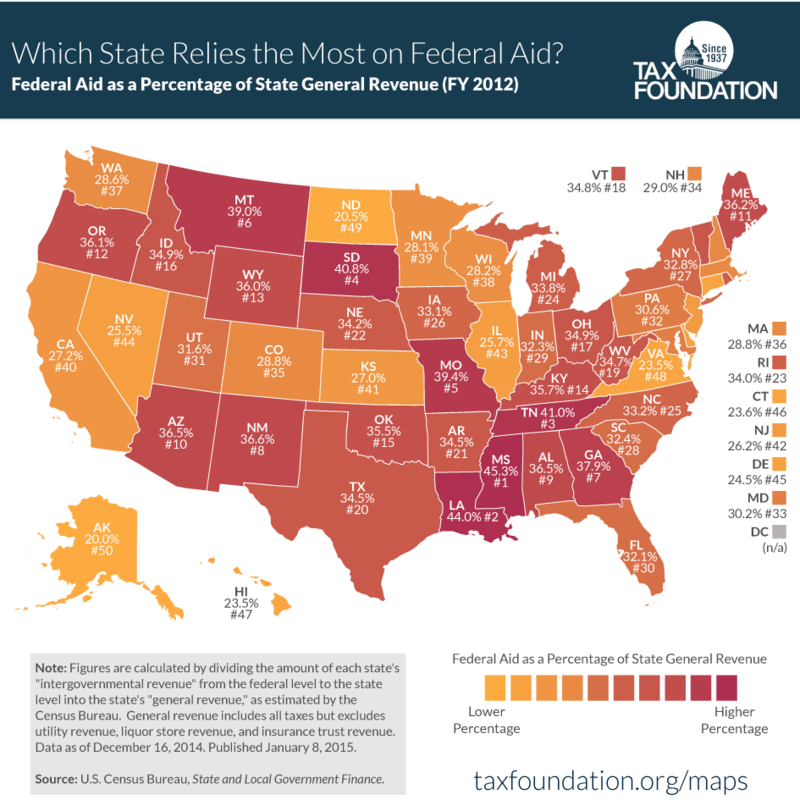 Home » What’s News » 50-State Tax Maps » Which States Rely the Most on Federal Aid? Though taxes are the most common and recognizable source of state government revenues, it’s important to remember that they’re not the only source. In fact, state governments received 31.5 percent of their total general revenues from transfers from the federal government in the 2012 fiscal year. That number varies pretty widely for specific states, however. For example, Mississippi obtains 45.3 percent of its total state general revenues from the federal government (the largest share in the country). Also on the high end are Louisiana (44.0 percent), Tennessee (41.0 percent), South Dakota (40.8 percent), and Missouri (39.4 percent). On the other end of the spectrum are those states who receive a much smaller share of general revenues from the federal government. The lowest federal share occurs in Alaska at 20.0 percent, followed by North Dakota (20.5 percent), Virginia (23.5 percent), Hawaii (23.5 percent), and Connecticut (23.6 percent).